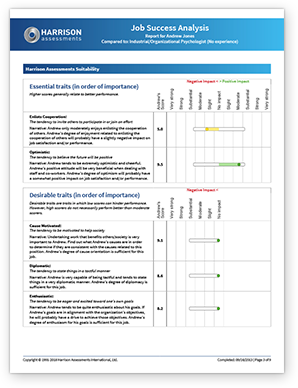 Our Job Success Analysis Report provides key insights into role placement by comparing individuals' behaviors and traits to specific job criteria and indicating their probability of success. 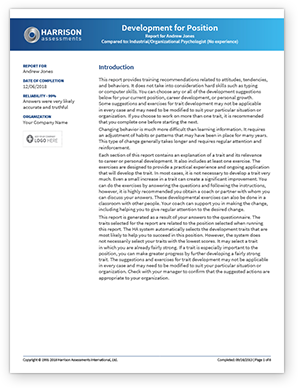 It provides essential data needed to make promotion or job rotation decisions and identifies the individual's development needs for the specific role. The Job Success Analysis report compares an individual's behaviors to the proven success factors for specific jobs. Our Paradox Report provides key insights into paradoxical behaviors that can either help or hinder success. Our Development for Position Report identifies key gaps related to job success and provides clear and practical employee development plans that target their specific development needs. These plans are tailored to a selected job or behavioral competency and give stepped exercises to develop an employee's required capability. 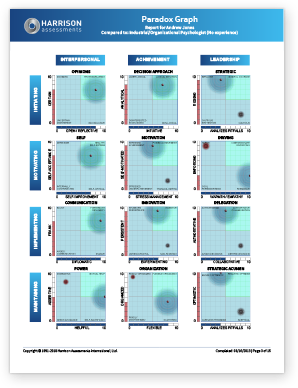 Behavioral competency reports compare an individual's behaviors to the behaviors needed for specific types of competencies including leadership competencies, emotional intelligence competencies, collaboration competencies, or any competencies that are customized for your organization.